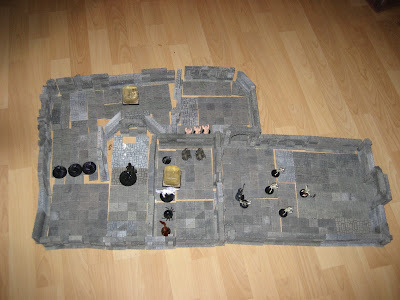 While I'm not of the opinion that the rules of Dungeons & Dragons should require the use of miniature figures to play, I do think it'd be a mistake to attempt to sever the game's historical link to their use and the photos throughout this post are a big part of the reason why. My 10 year-old son, unlike my nearly-13 year-old daughter, has rarely shown much interest in tabletop RPGs. He's much more of a video games kind of kid, like most of his peers, and I've never attempted to strong arm him into the hobby. If he's not interested, he's not interested; such is life. 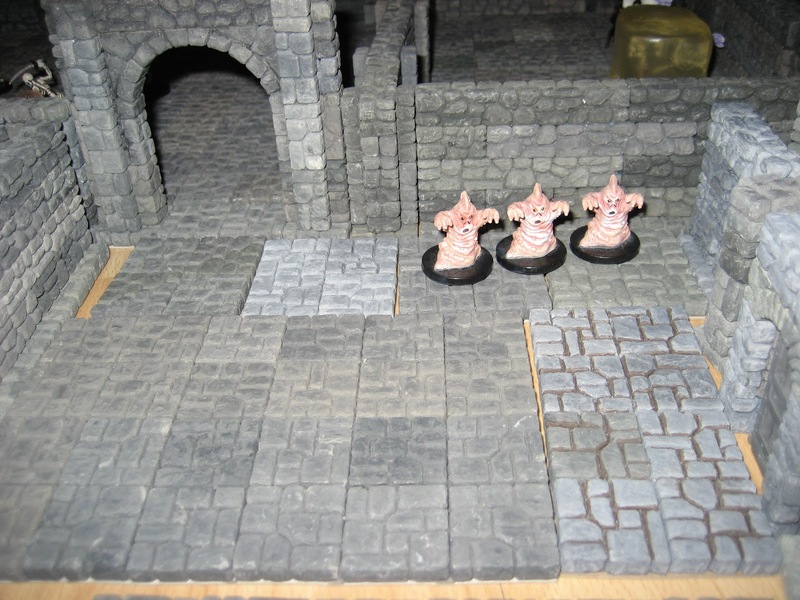 But he loves my Hirst Arts dungeon blocks and miniature figures (yes, many of them are WotC's plastic pre-painted ones -- I know: I'm a bad grognard). Last night, he asked me if I'd mind if he took them out and made (in his words) "a dungeon," which my wife then took photos of. 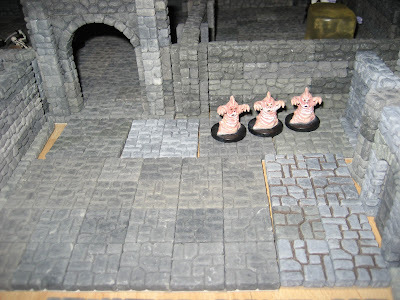 I remember very well that, as a young gamer, one of the things that most enthused me about gaming was seeing the elaborate dungeon set-ups that the older guys I knew used when they played the game. Likewise, I loved going to hobby shops and ogling the lovingly painted 25mm -- this was in the Dark Ages before "European-style" 28mm was the norm -- miniatures displayed in glass cases for delectation of patrons. Seeing those miniatures was one of several gateways into the hobby. I mention this because it's fashionable in the larger roleplaying world, including in many parts of the old school community, to deprecate miniature figures, suggesting that they're a thing of the past, like measuring movement in inches, and that "real" RPGs have no use for them. Five years ago, when I started this blog, I might have agreed with such comments. Now, I reject such notions wholeheartedly. As I said above, I don't want the rules of D&D -- or any RPG for that matter -- to depend on the use of miniatures, but I think we do our hobby a disservice if we treat miniatures as an atavism rather than what they are: a delightful option that can, in the words of Gygax, "add color and life to the game." 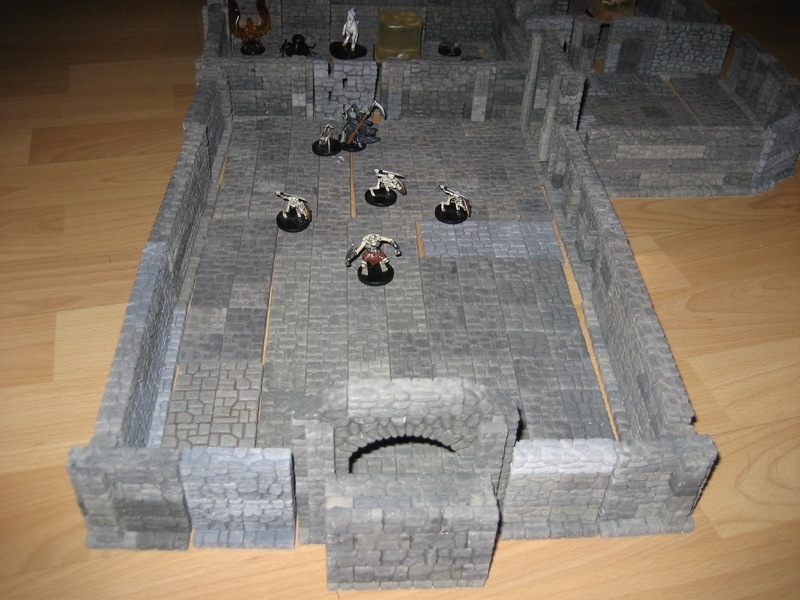 For a lot of people, miniatures add visual appeal and a degree of groundedness to roleplaying that might otherwise be lacking and there's nothing wrong with such an approach. 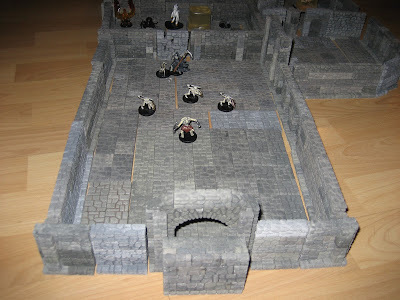 If, one day, my son does take a serious interest in tabletop RPGs, I have no doubt that it was miniature figures and dungeon tiles that paved the way for it. That's a good thing however you look at it.